The performances and results achieved by Hibs in the majority of big games this season provides evidence of their ability to rise to the occasion. Title rivals Rangers were overcome at Easter Road, while a string of Premiership opposition have been eliminated from the League Cup. Aberdeen and Dundee United were seen off at Easter Road while St Johnstone were defeated in the semi-final at Tynecastle. They came back from the dead at the same venue a week later with a late double salvo against Hearts in the Scottish Cup, and then edged the replay on home soil. However, despite those impressive results, it is the fixtures over the next three weeks which will define the club’s season. Hibs begin with a trip to Dumbarton this afternoon on Ladbrokes Championship business, before the cup competitions take centre stage. John Hughes returns to his old stomping ground with Inverness Caledonian Thistle in search of a Scottish Cup semi-final berth on March 5. A week later, Alan Stubbs will lead his side out at Hampden for the League Cup final, where they again face Highland opposition in Ross County. Wednesday night’s shock 3-0 home reverse at the hands of Morton may have been a timely reality check ahead of all the potential excitement to come. But while the lure of cup success is strong – particularly given a certain outstanding hoodoo – defender Liam Fontaine is in no doubt that promotion remains the priority, despite a cup final fast approaching. “It’s going to be a great occasion,” he admitted. “However, we can’t think about it until we’re there and until after the Inverness game. We need to focus on the two league games previous and the hopefully get into the next round of the Scottish Cup, which will be another great achievement. The League Cup’s a massive occasion for us and obviously it would be nice to win a trophy, but ultimately we need to get this club back into the Premiership and that’s our main agenda. “We’ve got some big games coming up with the first one today. “We’ve obviously got the cup game against Inverness and then the final. We’ve got some important games to look forward to and we can’t afford to let anything negative affect us. What Wednesday’s result does mean is that a response will now be expected from the dugout and the stands, and Fontaine believes the mental strength to do so exists within the dressing-room. 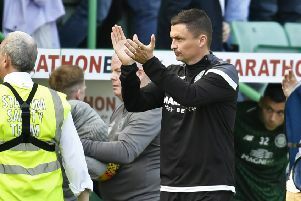 If Fontaine and his team-mates are to have any chance of going up as champions, there can be no more slip ups like Morton, with maximum points needed to try and overhaul Rangers. “Of course we’re going to have to look at it that way,” he conceded. “Rangers are going to have to drop points and if they do we need to be there. That’s all we’re going to look to do every time and keep putting points on the board whenever we can. “[Wednesday] was our game in hand and it would have shut the gap down to five points. It’s unfortunate and it is disappointing, but disappointments happen. Everyone knows that, in life not just sport. That means three points at the not so romantically named Cheaper Insurance Direct Stadium today are essential.